Yep. 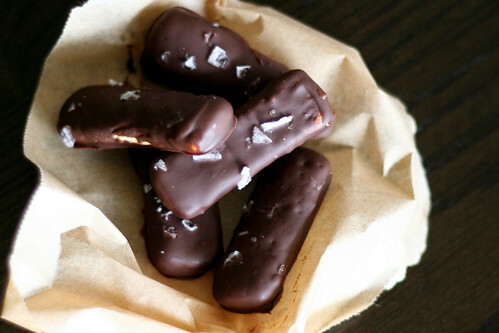 Salted Chocolate-Covered Graham Crackers. What else is there to say? These are amazing. I mean they’re graham crackers, epidemic covered in dark chocolate and sprinkled with flaky sea salt. The grahams are nice and crunchy. The chocolate is luscious and well, pharm chocolatey. And the salt? It balances the chocolate perfectly, information pills giving it a deeper taste, and the grahams a sweeter crunch. These are quite possibly the greatest snack on earth. I suggest you go buy a box of graham crackers, some dark chocolate and the flakiest salt you can find. Whip these up, then sit back with a cup of coffee and enjoy. Set up a double boiler by filling a medium saucepan halfway with water. Bring to a simmering boil at medium-high heat and place a metal bowl over the rim of the sauce pan. Reduce the heat to medium-low. Add your chocolate chips to the bowl and watch them melt. While the chocolate melts, place a large sheet of parchment or plastic wrap as close to the saucepan as you can. Once your chocolate is fully melted, itâ€™s time to dip your graham crackers. One by one, drop the graham crackers into the melted chocolate. If you’re using large crackers, make sure to break them into manageable pieces first. Use a couple of forks to flip the cracker in the chocolate until it’s completely coated. Transfer to the prepared parchment. As you place each graham on the parchment, sprinkle with a tiny pinch of flaky sea salt. Make sure to place each graham far enough away from itâ€™s neighbor so that they wonâ€™t be attached when the chocolate cools. Keep going until youâ€™ve covered all your grahams. Let the crackers set completely in a cool, undisturbed environment. This usually takes 2 – 3 hours. If youâ€™ve got leftover melted chocolate, pour it over ice cream immediately and enjoy. Or let it cool a bit and let your kids (or husband) lick it out of the bowl. Yum, yum, and yum! I love the sweet/salty combination. And it looks as though they are very easy to make. i’m dying…these look soo good! i love desserts w/ salt! Non nom nom! I can just imagine my early evening coffee-break with one of the bars!Looks luscious. I love salt on chocolate! When I was in Belgium, they had salted chocolates that were absolutely amazing – I can only imagine how much better they are with graham crackers too! mmmmmmmmmmmmmmmm! need I say more?!?!? I love how matter-of-fact your description is. You had me at the title of this post! I love salted chocolate, and I imagine it tastes fantastic wrapped around graham crackers. yum! Well, I better never make these or I will eat them all. No question. I remember when someone first turned me on to chocolate covered pretzels. I thought they were insane, then I was hooked! Thanks for the post and purdy pictures. Dana Zia – Chocolate covered pretzels. I can’t even make them anymore. I definitely can’t buy them. There’s just no stopping around them! I think you’re a genius. I love salted desserts – sweet and salty are perfect together. Thank you for this idea! Thank you for this recipe! I was out with my elderly aunt and we were reminiscing about chocolate covered graham crackers. I looked for some in a local candy shop and yikes, they were so expensive! I knew I could make a whole bunch for her if I found the right recipe, and yours fits the bill! I do love the Back to Nature graham crackers, and am wondering which brand of chocolate chips you prefer. Thanks!